Earlier this year, we brought in some really cool feeders made of felled wood. Each feeder is unique since it is cut and cored from real trees and from a variety of tree species. 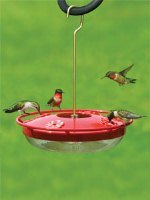 Our feeder is made of cherry, but there are also ones made of walnut, hackberry, sycamore, honey locust, birch and more. What I like about the feeder besides the one-of-a-kind uniqueness is the versatility of the feeder and the fact that the birds really do like it! I filled mine with shelled peanuts and spread Bark Butter® on the outside, giving me two feeders in one. I've posted most of the birds that have eaten from the feeder ranging from reliable chickadees to Rose-breasted Grosbeaks to a Black-throated Blue Warbler. I would recommend that you hang this feeder on a squirrel-proof set-up like our WBU Advanced Pole System, so your squirrels won't take a toll on the feeder and food. As winter nears, I'll keep mine filled with high-energy peanuts with a little Bark Butter on the side, literally. Scroll on down to enjoy all the birds that have visited my feeder. 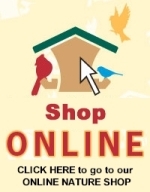 Feeders are available as of this writing at Wild Birds Unlimited - Saratoga Springs NY. They are made one-by-one in Ohio and birdhouses (bark-covered and turned) are also available. Hello, I'm from the u.k. I would like to order one of these feeders but having no luck trying to contact you via the link page. Do u have email address please so I could send you more info? Thanks Virenda. Glad to hear from you, all the way from India! Thank you Carmen. The birds like it too! Wow ! More beautiful ! I love it ! Shipping will add significantly to the cost. Love the fact you can put anything you want in it, and the way it looks..
Gary, thanks for your great comment! It is really unique and many people have never seen anything like it! This is one of the coolest bird feeders I've seen in recent months. Whoever thought of this is incredibly creative, especially considering that it puts felled trees to such a good use. I have always felt that if a tree has to be cut down, someone should make something useful out of it instead of it going to waste. Great article thanks for writing it and thanks for the inspiration. I'll definitely look into buying one of these feeders.